Are you an Adelaide Hills woman keen to work with other local women on projects that empower girls and women here and overseas? Come along to a meeting to meet club members and find out what we are all about. We meet on the third Tuesday of every month at Auchendarroch Tavern. Contact Us to book in so we can welcome you on the night. 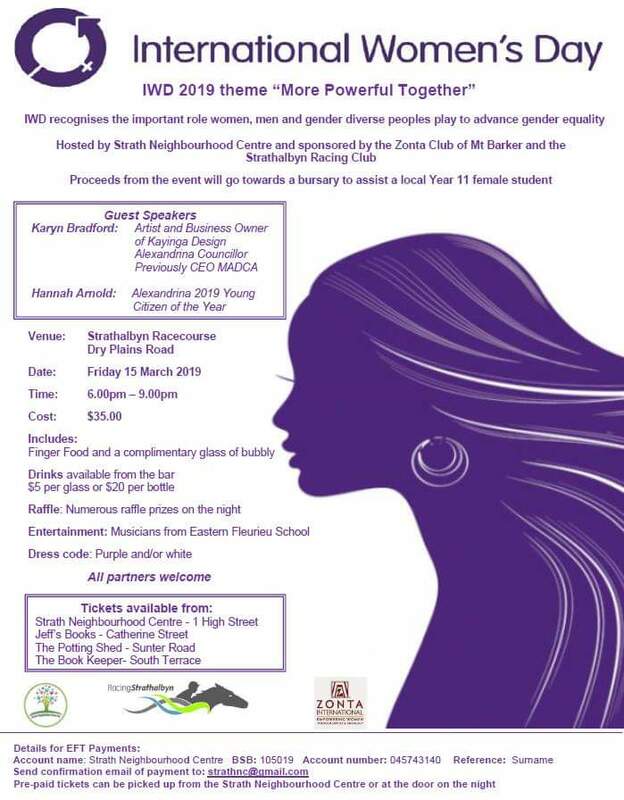 Please join the Zonta Club of Mt Barker at the Strathalbyn Neighborhood International Women's Day Celebrations. See Flyer below for details. Days For Girls Workshop - Saturday 17th November - at Cornerstone College, 68 Adelaide Road, Mt Barker. 10 - 3 pm. BYO lunch. Tea and coffee are provided. A wonderful day sewing reusable feminine hygiene products for women and girls who do not have these products available to them. 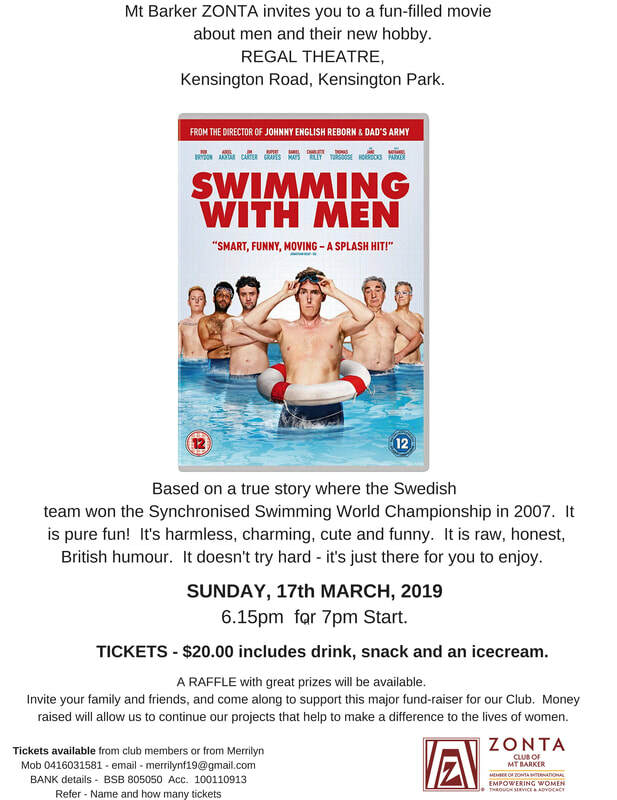 Mt Barker ZONTA invites you to a fun-filled movie about "starting over"
275 Kensington Road, Kensington Park. starts finding her feet...and romance. TICKETS - $20.00 includes drink, snack and an icecream. A RAFFLE with great prizes will be available. raised will allow us to continue our projects that help to make a difference to the lives of women. and a IWD green, purple and white ribbon. This project aims to reduce the incidence of Domestic Violence in the long term through an Engagement, Educational and Learning Program, which Embeds the learning through Art Work that will then displayed at a Community Celebration on White Ribbon Day. Proceeds to Mount Barker Zonta projects. Come and support the club on the day! Thanks Bunnings!! Every ninety seconds, a woman dies of complications related to pregnancy and childbirth. Approximately 525,000 women die annually in childbirth, many from infections acquired during childbirth. For every woman who dies in childbirth, probably 30 incur injuries and infections - many of which are often painful, disabling, embarrassing, and lifelong. 60 million women give birth each year with the assistance of a Traditional Birth Attendant or no assistance at all. Zonta Birthing Kits provide for a clean birthing environment that decreases the risk of death from infection and bleeding. Birthing Kits also help prevent the spread of infection and disease to/from the Mother/Child/Birthing Attendant. Through Zonta action, over one million birthing kits have been sent to developing countries so far! Kits cost $3 to make. If you are unable to join our assembly day, please consider making a donation to our club to enable us to assemble kits. A donation of $30 would enable us to make 10 kits, $300 would make 100 kits. In the reference area, please include your name and add BK after. Please email your details to us at mtbarkerzonta@gmail.com so we can acknowledge your donation. If you are interested in holding your own Birthing Kit Assembly Day or partnering with us, please contact Maura on mauraneeson@optusnet.com.au and she will provide you with information and assist you in holding a successful assembly day.